One woman’s sometimes raunchy, always funny internal battle of status vs. substance. Following an accident Sarah Williams, a New York City socialite, is forced to reevaluate her values in this darkly comic, low budget gem. Is Sarah ready to put away her judgements and pearls to descend into the subways of redemption? Or will she continue up the photoshopped elevator towards a lonely, bitter Park Avenue high rise? Laugh out loud with hints of gag-me gross & riot girl angst, director Stefanie Sparks’ edgy comedic genius grapples with what really matters in a world of selfish selfies: friends IRL. With appearances by Phoebe Robinson (YOU CAN’T TOUCH MY HAIR, 2 DOPE QUEENS), Cathy Curtin (ORANGE IS THE NEW BLACK) and other emerging female comediennes. Check out the review on Hammer to Nail! Audience Choice Award, Honorable Mention, at Anthology Film Archives Winter Screening Series 2018! 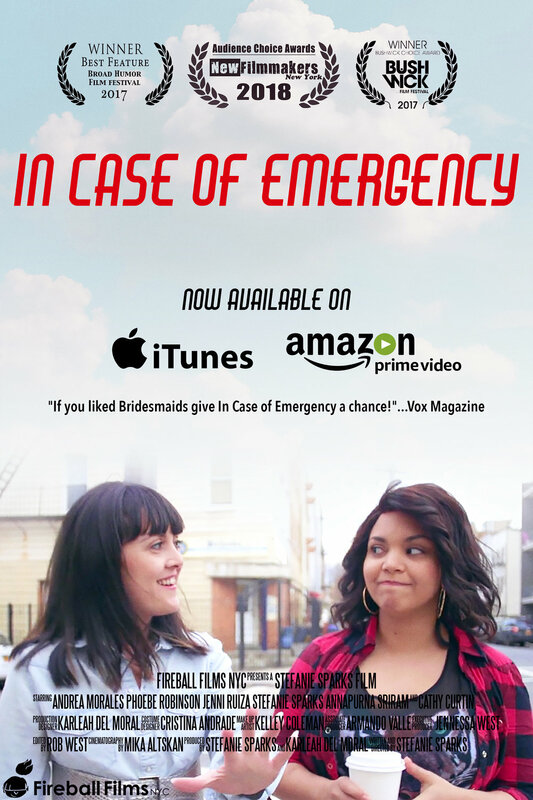 In Case of Emergency was chosen as a finalist in the Sundance Institute's Creative Distribution Fund and thanks to their support will be released this summer on various VOD platforms!! Bushwick Choice Award for favorite feature at Bushwick Film Festival!!! Jenni Ruiza is an NYC-based comedic actress, writer and producer. She began her professional career in 2011, where she signed on as a writer and featured player for the sketch comedy show "AY QUE FUNNY" created by comedian, Jesenia. Jenni has since gained credits as co-writer/producer for the hit web series, "BECOMING RICARDO", performing musical improv with The LocoMotives around NYC, co-hosting "COMEDY GIRLS", a radio show discussing everything from relationships to comedy on iHeartRadio, and as a regular commentator for Fusion's "Come Here and Say That". Jenni continues to gain credits in sketch comedy, web series, commercials, parodies, and doing commentary. Jenni is the co-founder, contributing writer, actress and executive producer of COMEDY HIGH, which produces female-driven comedy that's intelligently risque. She enjoys singing inappropriate songs whenever possible. She is currently working on 2 pilots and creating her own comedy content. Stefanie Sparks has been working in film for almost half of her life. Starting out on indie film sets in Seattle and reality TV in LA, Stefanie quickly made her way to NYC and the New School. Stefanie's 2nd feature film the gross-out girl comedy In Case of Emergency ( starring Jenni Ruiza, Phoebe Robinson, Catherine Curtin, Lisa Haas) won the audience choice award at Bushwick Film Festival after being selected as the opening night film. The film went on to win audience awards at Broad Humor, New Filmmakers and screened along side some of the top female directors in the world as part of Citizen Jane Film Festival in 2017. Stefanie earned her MA in Media and Film from the New School in NY. Her thesis film, Bleed, screened at STIFF (Seattle) and won special recognition for short form comedy at the Dorothy Hirshon Film Festival. She was granted a Jerome Foundation New York Filmmaker Grant for her debut feature, Cathy Coppola, which was nominated for the audience award at Brooklyn Girl Film Festival and Best in Show at the Female Eye Film Festival (Toronto). Stefanie has taught filmmaking at the Ghetto Film School's Midwinter Institute (the nation's first all film high school located in the Bronx, NY). Annapurna Sriram was born in Burlington, Vermont and moved to Nashville, Tennessee at the age of four. As a teenager, she was a championship Irish Step Dancer and attended Nashville School of the Arts. Annapurna graduated from Rutgers University with a BFA in acting from Mason Gross School of the Arts. In television, Annapurna has recurred on the Showtime series “Billions” with Paul Giamatti and Damien Lewis, NBC's "The Black List" with James Spader and Megan Boone, and the WeTV series “South of Hell” with Mena Suvari and Zachary Booth. She will next been seen in two independent films, Stefanie Sparks’ “In Case of Emergency” and Christopher James Lopez’s “Adrift." Sriram lives in Brooklyn, New York. She is an animal rights advocate and has been a vegetarian since the age of 8 (when she saw the movie “Babe"). Andrea Morales is a classically trained actor living in New York City. She is originally from West Lafayette, Indiana. Recently, Andrea was lucky to have worked on the development of many plays such as Stupid Kid by Sharr White, the living’ life of the daughter mira by Matthew Paul Olmos, Las Hermanas Padilla by Tony Meneses, and The Bridge of San Luis Rey by David Greenspan. 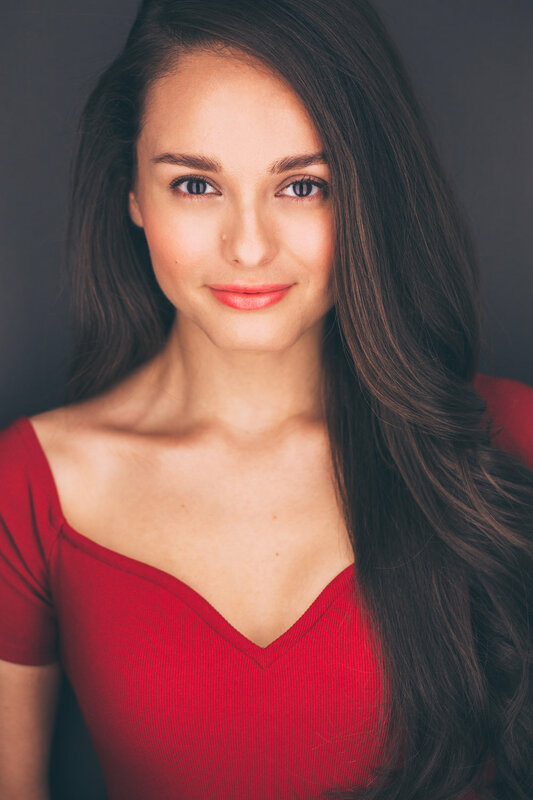 She was a proud participant of Carnaval in Chicago, is an ABC Diversity Showcase Alum and recently she has been seen on Bull (CBS) andThe Blacklist (NBC). Upcoming are the films Barrio Boy and Hearts Beat Loud starring Nick Offerman and Toni Collett which will be released in 2018. One of the best female stand-up comedians in the country, Phoebe has probably made you laugh without you even knowing it. Besides appearing on Last Comic Standing, Totally Biased with W. Kamau Bell, and Broad City, Phoebe is also a writer for MTV's Girl Code and Glamour.com. Phoebe rocks a WNYC podcast with Jessica Williams (2DopeQueens), recently released her first book, You Can't Touch My Hair (NY Times Best Seller) and stars in Refinery 29's web series Woke Bae and those are just the bullet points. The girl is blowing up!